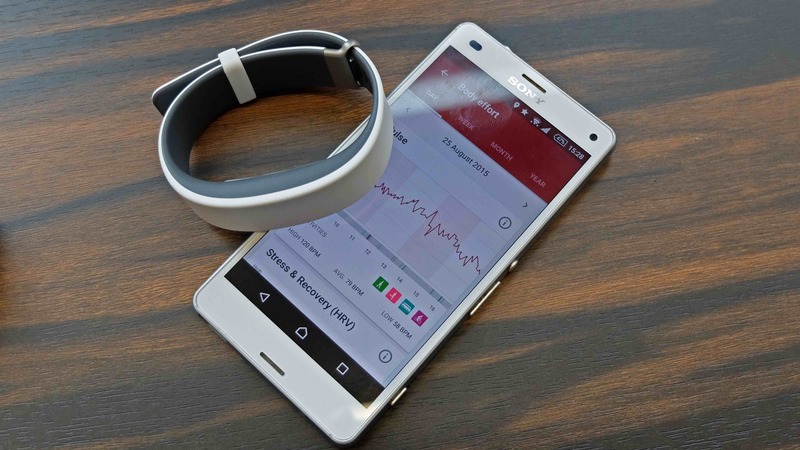 Can Sony finally make some headway in the fitness tracker space? There's nothing game changing about Sony's SmartBand 2, its new Fitbit Charge HR rival with a heart rate monitor that aims to track the whole quantified self, not just fitness. That said, it's an affordable €119 tracker that tries to integrate health and fitness tracking with the rest of your life, most successfully by attempting to track stress levels. But does it do basic tracking well enough to compete with Fitbit and Jawbone? It's about the same size as the Charge HR, so on the chunky side for a fitness band. It feels light, robust and comfortable on the wrist and with a clever, not too fiddly clasp to keep everything flush and tidy. Ladies, take note, it's a wider band than the likes of a Jawbone UP3/4. It's also very minimalist and there's no texture or design flair as on the Jawbone or even Fitbit's latest tracker. This is very much old school fitness band design and it's a shame Sony hasn't moved on. With the heart rate tracking module, it can't be slim and small like a Mi Band so Sony should at least have made it look more attractive. After all, with all the Lifelog integration, this is designed to be worn all day, everyday. We got a look at the (two tone) white and black models but Sony will also be launching pink and indigo hues later this year plus the module can be swapped out and used with other bands. The whole thing is waterproof to IP68 which one ups some rivals as the SmartBand 2 can be used in fresh water up to 3m for 30 minutes, Sony also states that 'casual use' in chlorinated pools is OK as long as you rinse it in fresh water afterwards. In other words, it's fine for leaving on in the shower and we got rained on numerous times while wearing the SmartBand 2 and - incidentally - using a Z3 Compact without any problems. The main difference between this tracker and its predecessor is the heart rate monitor. Returning are the vibration alerts for calls, texts and notifications - which are not very subtle - a smart alarm wake-up feature and an out of Bluetooth range alert so you don't use your phone. So far, so standard, so 2014. The apps you are alerted to can be customised in the SmartBand 2 app but there's no contact or keyword control. Somewhat obviously, there being no display, the tracker also won't tell you the time or weather or anything like that either. Plus your steps, distance, time spent active and estimated calories burned are all access via apps, not on the band. It's worth mentioning that it is compatible with Google Fit on Android and Apple Health on iPhone. Pairing can be done via good old-fashioned Bluetooth of NFC if your smartphone has the tech. Apart from some basic media controls - you can set the button to play/pause and skip music if you wish - that's it for non-tracking features. Still, chances are you're not considering buying this as an alt-smartwatch. What's nice about the SmartBand 2's optical heart rate tracking is that there's lots of choice over how you want to use it. Double tapping the tiny power button on the right hand side of the tracking module puts the band into continuous HRM mode, the battery life for which you'll get ten hours. It's quick and not at all fiddly to press this at the start of a run or workout and the strong vibrations indicate immediately that it's kicked in. Otherwise, the SmartBand's stated two day battery life is based on heart rate tracking 5 - 6 times per hour, including when you are asleep. Stamina mode which gets you five days turns the heart rate sensor off entirely. It's a nice solution to cater to different levels of user and the readings we got at rest and during exercise are within 5 - 10 bpm of a chest strap. So that's not perfectly accurate but it's similar to the results you'd get from a Charge HR: accurate enough for beginners looking to see, for instance, their resting heart rate go down as they get fitter. The stress and recovery metrics, measured by your heart rate variability, are more difficult to test but low stress periods did correlate to an hour of sitting down working and medium/high stress periods logged to exercise. The graphs and timelines could be incredibly useful here if you're looking to reduce your stress levels and it's fascinating stuff. Read this: Will tracking our stress levels really make us more calm? Strangely enough, what's slightly more worrying is the standard steps and distance tracking which both averaged out on the slightly more generous side when compared to other trackers and watches, such as Misfit on Pebble Time, worn simultaneously. That's something to bear in mind. In fact, on a day where I left the SmartBand 2 at home on the desk, it managed to track 177 steps. It's limited too - Sony tracks walking, running and cycling as separate activities but not gym sessions or sports, unless you manually enter the data. Sleep tracking records the number of hours you were asleep with automatic sleep detection which was accurate enough slightly more than it got things wrong. What's nice here is that by tracking broad periods of deep and light sleep, the smart alarm can wake you during light sleep once you've set certain parameters. Sleep monitoring is a tricky one to get right, and if you move around a fair bit at night, the SmartBand 2 will think you're up and about. The SmartBand 2, which is both iOS and Android compatible, syncs with both a dedicated self-titled app and Sony's Lifelog app on Android or Apple Health on iPhone. This might sound confusing but the two actually work together - for changing settings and on the spot heart rate readings, it's the SmartBand 2 app. For everything else - graphs, milestones, sharing data with others, seeing which activities affected your stress levels, on Android it's the Lifelog app - this is what we tested the SmartBand 2 with. It's worth noting that Sony claims to be able to track your stress levels through a combination of three sets of data - first, your pulse, second, your sleep and third, your heart rate variability. As Lifelog isn't just for fitness, in theory you will be able to see what is affecting your stress and energy levels - a scary film, a workout, whatever. You can even hook the app up to Spotify. It's a clever approach and Sony's graphics are slick but in use, Lifelog is a bit crowded. It's not always clear - at a glance - how we were doing in terms of our daily or weekly progress. There's plenty of detail and charts to dig down into but with no swipeable metrics on the band itself, we're not sure how motivating the in-app grid of out of context stats will actually be for beginners plus Sony doesn't offer pro stats, like Garmin Connect does, for real enthusiasts. With heart rate monitoring on, we found we got two to three days out of the SmartBand 2, depending on how much continuous tracking we needed. Considering there is no display and the battery life is a maximum of five days with no HRM whatsoever, the battery performance is OK but nothing to write home about. Rival, cheaper trackers, from Misfit and Jawbone, that count steps, distance and track sleep can last for months on one charge, for instance. Charging is via micro USB which is easy enough - the module pops right out and you just plug it in for one to two hours. Battery life can be viewed in the Sony SmartBand 2 app or via the three LEDs next to the band's single physical button. This makes the SmartBand 2 feel more like a gadget than it would if it had a smartwatch-style charging dock. But most fitness trackers come with fiddly proprietary cables and cradles so Sony's gets bonus points for this addition. The Sony SmartBand 2 isn't the prettiest or most accurate or even the longest lasting fitness tracker at around this price point. Still, for £100 you get heart rate monitoring which fits into a wider picture of your lifestyle habits and stress levels. It's also water resistant and works with iOS and Android. Most people should fork out a little extra for the Fitbit Charge HR if you are considering this tracker but Sony is moving in the right direction with its tech and software. We just need a more stylish design and a clearer focus on motivating users in its crowded app. this is the deepest review, I've read for this smartband. thanks for the info.